What Is The Label Rewind Direction? Why Is It Important? Are you new to the world of machine application? Do you wonder what your co-packer means when he talks about rewind codes? Wondering what the core size should be or even the maximum outside diameter is for your roll? If you have any of these questions look no further! You are in the right place! Many growing companies that have a product requiring a label will sometimes find that switching over to machine application of labels can save them time and money in the long run. There are essentially two ways that business owners can proceed with machine application if they are tired of putting labels on by hand or just no longer have the time to do it. One- they can hire a copacker, or two- they can buy a machine and do it themselves. 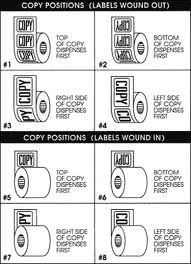 By the way, if you are looking for a recommended co-packer or labeling machine we can help you make a good choice! Copackers already have the labeling equipment in place so if you are a small business you might not want to shell out 30K on a new labeling machine and let a good copacker help you grow. On the other hand, if your company is growing like unwanted garden weeds you may want to consider investing in your own pressure sensitive labeling equipment. When you put a roll of labels in to an application machine there are certain things to take in to consideration. The most important things are how the label is placed on the product, which direction the text and art should be facing, and how the consumer is going to see what the label says or displays. If your copacker is asking you what the rewind code is then he is referring to the direction that the label comes off of the roll.